MultiLog is a log system that aims at flexibility and low overhead at the same time. As the name suggests, it can be used to log to several targets such as a text file, a visual control or to another application. Adding new targets is as easy as creating a class that implements two methods, one being optional. MultiLog is in general similar to CodeSite, Smart Inspect, Overseer and EstLogger but it does not follow closely any of them, implementing many things differently and, even, having some unique features. 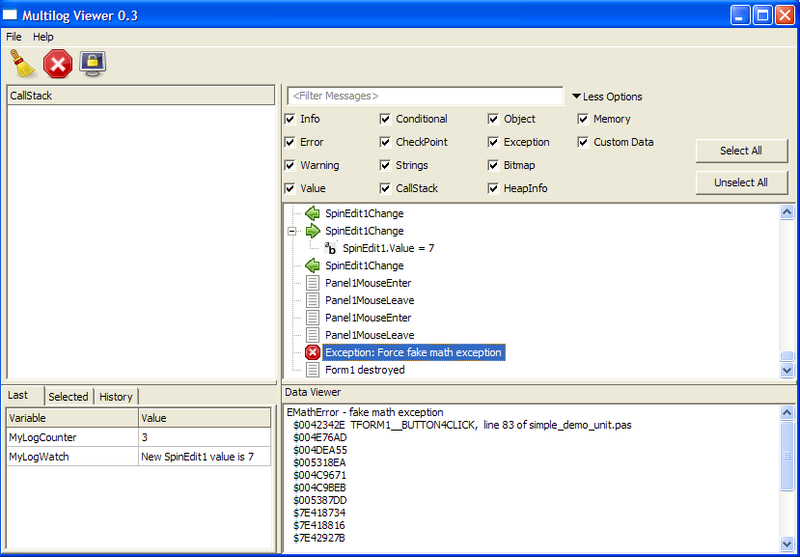 Starting from version 0.5, the base library can be compiled with Delphi. Install multiloglaz package into Lazarus and build MultiLogViewer from it's Viewer directory. 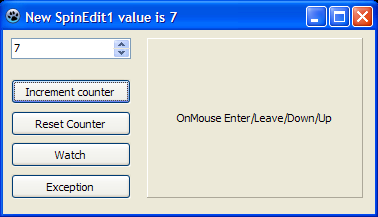 Create new application, and add 4 buttons, 1 spinedit, and 1 panel to main form. Replace code with the one below. Start MultiLogViewer, run your application and logging will start. Since we have added both ipc and file channels for logging (in Form's OnCreate method), even if MultiLogViewer is not started we will have logging to 'debug.log' file. If you want your logged exceptions and stacks to show source code line numbers of the runtime error like on the screenshot above then go to Project / Project Options / Compiler Options / Debugging and switch on check boxes for 'Generate debugging info for GDB' and 'Display line numbers in run-time error backtraces'. To override this problem since version 0.2 the unit path of the lazarus package points to $(PkgDir). This has the drawback of breaking the "multienviroment" schema that separates binaries of different targets used in most packages. As a side effect when compiling projects that requires multilog package, fpc will create duplicated units in the project path and Lazarus IDE warn about them. Just ignore the warnings. While developing MultiLog i had some problems with inlines (See this bug). All inlines were commented. Because of this all calls to the overloaded SendCallStack that has a implicit classes (DefaultClasses) will have SENDCALLSTACK as the first frame. Use the explicit SendCallStack overloaded function as a workaround. Waiting for fpc2.2 to re-enable inline. This page was last modified on 22 September 2017, at 12:34. This page has been accessed 18,210 times.